ADR and GDR are commonly used by the Indian companies to raise funds from the foreign capital market. The principal difference between ADR and GDR is in the market; they are issued and in the exchange, they are listed. While ADR is traded on US stock exchanges, GDR is traded on European stock exchanges. Depository Receipt is a mechanism through which a domestic company can raise finance from the international equity market. In this system, the shares of the company domiciled in one country are held by the depository i.e. Overseas Depository Bank, and issues claim against these shares. Such claims are known as Depository Receipts that are denominated in the convertible currency, mostly US$, but these can also be denominated in Euros. Now, these receipts are listed on the stock exchanges. ADR and GDR are two depository receipt, that is traded in local stock exchange but represent a security issued by a foreign public listed company. Meaning ADR is a negotiable instrument issued by a US bank, representing non-US company stock, trading in the US stock exchange. GDR is a negotiable instrument issued by the international depository bank, representing foreign company's stock trading globally. Relevance Foreign companies can trade in US stock market. Foreign companies can trade in any country's stock market other than the US stock market. Issued in United States domestic capital market. European capital market. Listed in American Stock Exchange such as NYSE or NASDAQ Non-US Stock Exchange such as London Stock Exchange or Luxemberg Stock Exchange. Negotiation In America only. All over the world. Market Retail investor market Institutional market. American Depository Receipt (ADR), is a negotiable certificate, issued by a US bank, denominated in US$ representing securities of a foreign company trading in the United States stock market. The receipts are a claim against the number of shares underlying. ADR’s are offered for sale to American investors. By way of ADR, the US investors can invest in non-US companies. The dividend is paid to the ADR holders, is in US dollars. ADR’s are easily transferable, without any stamp duty. The transfer of ADR automatically transfers the number of shares underlying. GDR or Global Depository Receipt is a negotiable instrument used to tap the financial markets of various countries with a single instrument. The receipts are issued by the depository bank, in more than one country representing a fixed number of shares in a foreign company. The holders of GDR can convert them into shares by surrendering the receipts to the bank. Prior approval of Ministry of Finance and FIPB (Foreign Investment Promotion Board) is taken by the company planning for the issue of GDR. 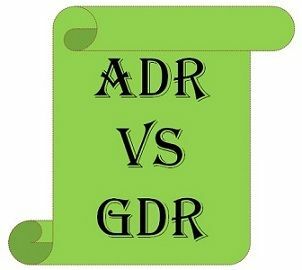 ADR is an abbreviation for American Depository Receipt whereas GDR is an acronym for Global Depository Receipt. ADR is a depository receipt issued by a US depository bank, against a certain number of shares of non-US company stock, trading in the US stock exchange. GDR is a negotiable instrument issued by the international depository bank, representing foreign company’s stock that is offered for sale in the international market. With the help of ADR, foreign companies can trade in US stock market, through various bank branches. On the other hand, GDR helps foreign companies to trade in any country’s stock market other than the US stock market, through ODB’s branches. ADR is issued in America while GDR is issued in Europe. ADR is listed in American Stock Exchange i.e. New York Stock Exchange (NYSE) or National Association of Securities Dealers Automated Quotations (NASDAQ). Conversely, GDR is listed in non-US stock exchanges like London Stock Exchange or Luxembourg Stock Exchange. ADR can be negotiated in America only while GDR can be negotiated in all around the world. When it comes to disclosure requirements for ADR’s, stipulated by the Securities Exchange Commission (SEC) are onerous. Unlike GDR’s whose disclosure requirements are less onerous. Talking about the market, ADR market is a retail investor market, where the investor’s participation is large and provides a proper valuation of a company’s stock. As opposed to the GDR, where the market is an institutional one, with less liquidity. Many publicly listed companies in India, trades their shares through Bombay Stock Exchange or National Stock Exchange. Many companies want to trade their shares in overseas stock exchange. Although, the companies need to comply with some policies. In such a situation companies get itself listed through ADR or GDR. For this purpose, the company deposits its shares to the Overseas Depository Bank (ODB) and the bank issues receipts in exchange for shares. Now, every single receipt consists of a certain number of shares. These receipts are then listed on the stock exchange and offered for sale to the foreign investors. Depository Receipts help the Non-Resident Indian’s or foreign investors to invest in Indian companies by using their regular equity trading account. If a domestic company directly lists its shares on a stock exchange, then it must comply with the stringent disclosure and reporting requirements and should pay the listing fees. Depository receipt is an indirect route to enter and tap multiple markets or single foreign capital market. This is a part of the management strategy of most of the companies to get listed overseas, to raise funds, to establish the trading presence in foreign markets and to build brand equity.